When I am teaching evolution, I often like to ask my students to think about why a particular feature or trait evolved. I might, for example, ask them why flying squirrels evolved a flap of skin between their legs that allows them to glide between trees, and when I ask questions like this, I frequently get responses along the lines of, “they needed that trait.” This is a very common misconception about evolution. Although most people realize that there isn’t a conscious entity controlling evolution, they nevertheless think that natural selection provides organisms with the traits that they need. This misconception can even lead to fallacious arguments such as, “if evolution is true, why hasn’t a perfect organism evolved?” The reality is that natural selection is constrained by the genetic variation that is currently in a population. Thus, it can only select among the available traits, rather than giving an organism what it truly needs. Therefore, we do not expect evolution to ever produce a perfect organism. Note: in this post I am using the term “evolution” to refer specifically to evolution via natural selection. There are several important points for understanding why evolution doesn’t given an organism what it needs. First, we have to realize that evolution is blind. I explained this in detail in a previous post, but to put it simply, evolution has no foresight or goal that it is working towards. It cannot predict the traits that will be useful to an organism in the future. Thus, even if evolution could give an organism what it needs right now that would not necessarily be what it needs several generations from now. The second important point is simply that natural selection is limited to the variation that it has available to it. Let’s think about the flying squirrel example for a second. We can think of lots of traits that would be very useful to that animal. For example, it would surely be useful for the squirrels to be able to propel themselves at rocket speeds with explosive flatulence, but natural selection cannot make that happen unless the genes for explosive flatulence are available in the population. More realistically (although less amusingly), small, sharp quills in their fur would be very useful for warding off predators. Similarly, a musk gland like a skunk’s would have great benefit, but squirrels don’t have that weaponry because they don’t have the genes for it. Natural selection can’t make a trait out of nothing. It has to work with the genetic building materials that are available to it, and this means that we will probably never see a gas powered squirrel rocketing through the trees (too bad, that would be neat). Fortunately, there is a mechanism for making new genetic information. I am of course referring to mutations. Natural selection actually removes variation from a population. So if natural selection was allowed to run its course without any interference, you would eventually get a population of clones. Thus, mutations are very important because they add new genes to a population. In other words, they give natural selection new material to work with. So, although squirrels do not currently have the genes for quills or a powerful skunk-like musk gland, they could someday have those features if the right mutation comes along. The catch is that mutations are totally random. Most of them are neutral (no harm or benefit), a few are harmful, and a few are beneficial, but exactly which ones you get is completely random. So, it doesn’t matter how badly you need a new trait. Whether or not you get the particular mutation that you need is pure dumb luck, and the fact that you need a trait has no effect on the likelihood that a mutation will provide that trait for you. Finally, it’s important to realize that evolution is often a trade-off between traits. It operates on simple cost/benefit ratios, and anytime that the benefit of a trait outweighs the cost, natural selection will favor that trait. Human backs are a phenomenal example of this. The human back is an absolutely horrible design for supporting upright weight. It’s just terrible. That’s part of why so many people develop back problems. So why do we have such horrendous backs? Well, we evolved from quadrupeds, and the basic structure of our back isn’t half bad for walking on all fours. We evolved to be bipedal, however, because being bipedal has lots of advantages. Most notably, having hands rocks! By walking upright, our ancestors could use their hands while they were moving. They could pick fruit on the go, carry large prey back to camp, use weapons, collect building materials for making shelter, etc. All of these abilities were extremely beneficial to our ancestors. Therefore, the benefits of being bipedal outweighed the costs of having a bad back. Also, notice that evolution couldn’t give us the back that we needed because it was constrained to the building materials available to it. All it could do was modify a back that had evolved for being a quadruped. It couldn’t make an entirely new back from scratch. Now, some people may still wonder why evolution hasn’t made a better back than what we currently have, and there are several answers to that. First, we again have to consider the limitations of evolution. Natural selection can only improve our backs if it has the genetic material necessary to do so. So we are at the whim of random mutations. Also, selection pressure has a big role here. Natural selection only favors a trait when it affects reproductive ability, but back problems often arise after the key child bearing years. This would give it a fairly low selection pressure because nature doesn’t care how long you live once you’ve had all of your children. In other words, longevity is selected for only if it increases the number of genes that you get into the next generation. Finally, we have only relatively recently expanded the average human life expectancy beyond around 35, and many back problems don’t arise until later than that. So if most people die before back problems develop, then there is nothing for nature to select. Also, because humans are social, even in a pre-industrialized society many people with back problems would still be able to live and have children. So, again, there wouldn’t be much for nature to act on. 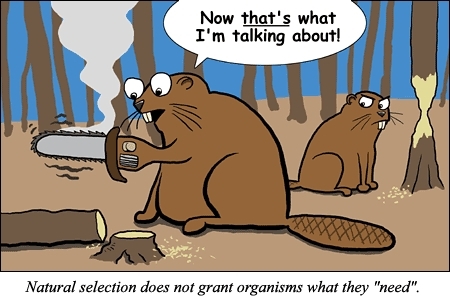 In summary, evolution doesn’t grant species what they need. It has no foresight, it can only act on the genetic material that is available to it, and it relies entirely on random mutations to provide new building materials. This results in modifications to existing traits, which often involves some form of a trade-off, and rarely produces the trait that is truly needed. This entry was posted in Science of Evolution and tagged evolution, evolution is blind, natural selection. Bookmark the permalink.